A pair of Apple iPhones will be getting launched next month. By launched, we mean that the two smartphones will be blasting off on the Atlantis space shuttle for a rendezvous with the International Space Station. Installed on the Apple iPhones will be an app created by Odyssey Space Research called Space Lab for iOS which will help the handsets conduct four experiments while in space. Odyssey Space Research says that the four experiments include a "Limb Tracker" experiment that will have the iPhone snap pictures of the earth. In the words of the research firm, this will involve, "matching an arc to the horizon through manipulation of an overlay," which will help to, "yield an estimate of altitude and 'off-axis' angle, a measurement of the angle of the image with respect to the Earth's center." The second experiment will help the Apple iPhone calibrate certain sensors that will help improve the accuracy of the measurements obtained from future iPhone readings. In addition, the handset's gyroscope and accelerometer will be used to come up with the longitude and latitude of the shuttle. And finally, in a timely experiment, the iPhone will be used to measure the radiation that the unit itself emits while in space. The great thing is that you do not have to be a rocket scientist to conduct the same experiments. An App Store version of the Space Labs for iOS is available for 99 cents and will let you perform the same four trials with the information simulated to account for "the presence of gravity" which of course, is not found in space. 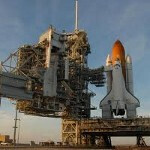 The last space shuttle launch will be on July 8th and the two Apple iPhone units will be strapped in nice and tight. Since its earth-bound launch in 2007, the device has taken the smartphone industry to new heights, but nothing like this. And considering that this will mark the end of the program, these two Apple iPhones will be probably be setting some records for travel that may never be broken. Before the Android/Iphone wars start i'm just going to say something...your both at the same level of fanboy-ism and you both practically have the same functions. Its funny how i read about Isheep bragging about their perfect Iphones and then Android fanboys backfire by telling them what the iphone is missing and how much better android is. Your all the same, and this is coming from a wise old dinosaur blackberry and symbian user who has no care for an entertaining device like WP7 with their Xbox live. sorry, i was typing carelessly. I hear steve jobs himself is installing a tower on the international space station just so someone can download the new copy of angry birds set to launch, bet. Im pretty sure android will break the record by visiting mars!!! what i dont understand is that the GS 2 is in al topics without being released in the States yet.. ?....if so can i talk about the Motorola Ultimate 7G coming in 2015?